We present the new electromagnetic modeling feature in the CIVA software. Elements of the fast-running eddy current modeling code MESSINE (Models for Electromagnetic Simplified SImulation in Nondestructive Evaluation) are now available in CIVA. This software, developed at CEA/CEREM is a multitechnique platform (ultrasonic, radiography, electromagnetics) for NDT. Simulating electromagnetic tubing control with accurate results on defects is presented. A software is developed at CEA devoted to the processing, the imaging and the simulation of NDT data. It is called CIVA (from the name of the Indian goddess Shiva whose many arms allow her to achieve various tasks...). It currently deals with ultrasonic, eddy-currents and X-rays NDT techniques. The program runs on workstations with Motif based graphical user interface and on PC. Laboratory and industrial versions of the software are developed. In the former, each parameter can vary whereas in the latter some parameters are fixed (matching the specific configurations considered) to minimize human error. In what follows, we focus on the eddy current simulation facilities of CIVA. Imaging and processing tools are only mentioned since they are used to display the simulated results. Note that CIVA makes it possible to display and superpose data measured (or simulated) by various techniques on the same image. Eddy current non-destructive testing (ECNDT) is widely used to inspect conducting materials during manufacture or in service. One long-standing and particular concern of CEA/CEREM is the inspection of Pressurized Water Reactors steam generator tubing. Defect identification is carried out with the parameters extracted from eddy current signals (mostly variations of complex impedance). In this context, modeling is a powerful tool for inspection improvements: it helps probe-coil designers optimizing sensors for each examination requirement, it gives better understanding of the involved physics, it helps operator training and it also increases defect analysis reliability. Providing an accurate and fast running answer to these ECNDT needs, MESSINE (Models for Electromagnetic Simplified Simulation in Nondestructive Evaluation) has been developed in different dedicated ways and was presented and detailed in [1-3]. Probe-coils are designed using 2D analytical modeling, 3D semi-analytical modeling and a "layer approximation" to simulate defects. Accurate defect simulation can be obtained in 2D using a "multi-transformer" approach (semi-analytical). In 3D, defects are introduced in the model using reciprocity and superposition theorems. Among theses, tubing control modeling has been first introduced in CIVA. The resulting facilities are presented hereafter. For the considered 2D defect free configurations or with axisymmetric defects, MESSINE is built on the "Multi-Transformer" approximation : the continuous distribution of the induced currents is discretized in a set of constant current loops. For each loop, the resistance and all the inductances (with the other loops and with the probe-coil) are analytically derived from the conductor geometry and the probe characteristics. Fig 1: Modeling by cylindrical approach. where y is the difference in azimuth between the two cylinders. This integral Ci is the heart of the problem: if the radii R1 and R2 are not equal, we use the Fawzi & Burke's algorithm based on Bartsky's transformations, if not we use our own algorithm based on the Newton-Cotes formulas. Knowing all the resistances and inductances, the loop intensities are computed by solving the linear system governing the multi-transformer formulation. Finally the impedance can be derived using Lenz's law. A Lissajous'curve -described with 10 scanning points- is obtained very accurately within a minute on a standard PC. A comparison between MESSINE (40´ 10 loops) and experimental results is given for a bobbin coil scanning a 900 MW PWR steam generator reference tube at 240 kHz (4 different reference grooves with rectangular cross-section) (Fig. 2). Fig 2: Lissajous' curves from a bobbin coil in a SG tube for 4 reference defects (large outer groove 30% throughwall, 20 mm width (bottom left); inner groove 10% throughwall, 1mm width (bottom right)); outer groove 10% throughwall, 1mm width (top right), outer groove 40% throughwall, 1 mm width (top left)), MESSINE 2D results compared to experiment. Several axisymmetric configurations can be realized: a probe-coil in concentric tubes, a probe-coil over plates, a probe-coil encircling tubes and/or a bar (Fig. 3). In each case, there might be several different constituting materials. For all possible configurations, the impedance of the probe-coil is calculated. Here defects are thus either a loss of material (treated by withdrawing all elementary loops constituting the defect) or a region of different conductivity (treated as the rest of the material). We carried out this approach for defects with rectangular cross-section (Fig 4). Figure 5 shows results obtained for a 50 microns deposit in an external 20mm wide 30% through-wall defect with MESSINE compared with experiment measurements. Fig 5: MESSINE results vs experiment for a 50 microns deposit in an external 20mm wide 30% through-wall defect. Some elements of the fast running forward model, MESSINE are now available in the CIVA software, performing Multi-Transformer based approximations for defect free configurations or configurations with defects. Obtained simulated signals are very close to experimental EC signals. The model makes it possible to compute and display eddy currents and impedance changes. MESSINE is now used for probe coil design, for implementation of industrial NDT methods (e.g. frequency choice) and evaluation of the influence of perturbation parameters (e.g. lift-off), thus limiting the number of experimental tests. G. Berthiau, B. de Barmon, "MESSINE, An Eddy Current Parametric Model for flaw characterization", Review of Progress in Quantitative Non Destructive Evaluation, Vol. 18A, pp.501-508, Plenum Press, New York, 1999. B. de Barmon, G. Berthiau, "MESSINE: Models for Electromagnetic Simplified Simulation in Nondestructive Evaluation", Electromagnetic Nondestructive Evaluation (IV), Vol. 17, pp.50-57, IOS Press, 2000. 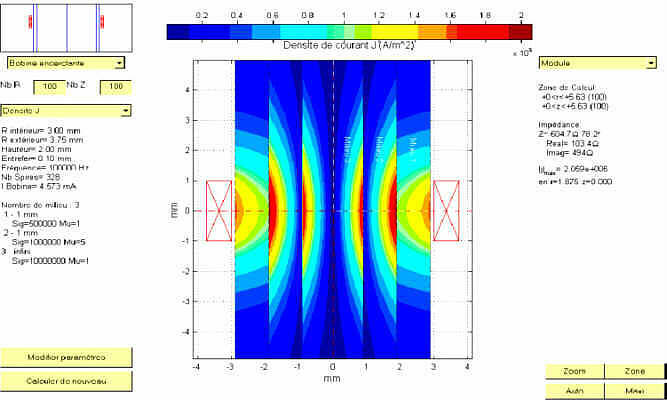 J. Juillard, B. de Barmon, G.Berthiau, "A simple analytical 3D EC model", IEEE Transaction on Magnetics , jan. 2000. T.H. Fawzi and P.E. Burke, IEEE Trans. Power Apparatus and Systems 97, 464 (1978).